02/26/2019 06:34 AMPosted by Boreashavent seen a shudderwock deck in wild since the nerfs....is it a new deck?Just like in Standard, Shudderwock is usually a solid tempo play, but Shudder decks that try to go for "infinite" or combo shenanigans will more often that not fold to any deck trying to end the game in an expedient manner.Sure, when a combo Shudder does go off the game can drag on, but a Shudder deck rarely manages it against competetive decks. Because most competetive decks are designed to actually kill their opponent rather than faff about doing nothing for 15+ turns. 02/24/2019 05:41 PMPosted by TeoIt’s not that they’re “good”; at heart, they’re only vanilla minions with no effects, but they make the math work out when you need it to most, and that counts for a lot more than their stats suggest.The presence of one of these 1-drops combined with the upgraded hero power also makes it less valuable for the opponent to attempt to answer them with their own 1-drops. This is also something you should keep in mind when going second. 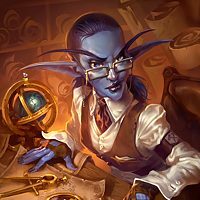 Why many players left Hearthstone? What is "random selections" were remove ? Is Hearthstone proud of OTKs? 02/19/2019 12:56 PMPosted by JgokaI'm just wondering how having an OTK in the game is something that HS/people want.As strange as it may sound, different people look for different things from their games.You may want to look up the articles about Timmy, Johnny and Spike by Mark Rosewater (the head designer of MtG). They go into some detail about what different players find engaging in a game and touch upon why a TCG/CCG should not try to completely shut out a certain subsection of the playerbase (at least not if they want long term success). Zilliax is currently considered the most genrally powerful non-Classic Legendary. Any word from devs on genn/baku? 02/15/2019 03:21 PMPosted by WarsongRebalance Baku/Genn mana and stats too.They could be 25/26 mana 0/1s with no way to reduce the cost and the decks that play them would still play them.